Guess what guys? It’s my birthday!! 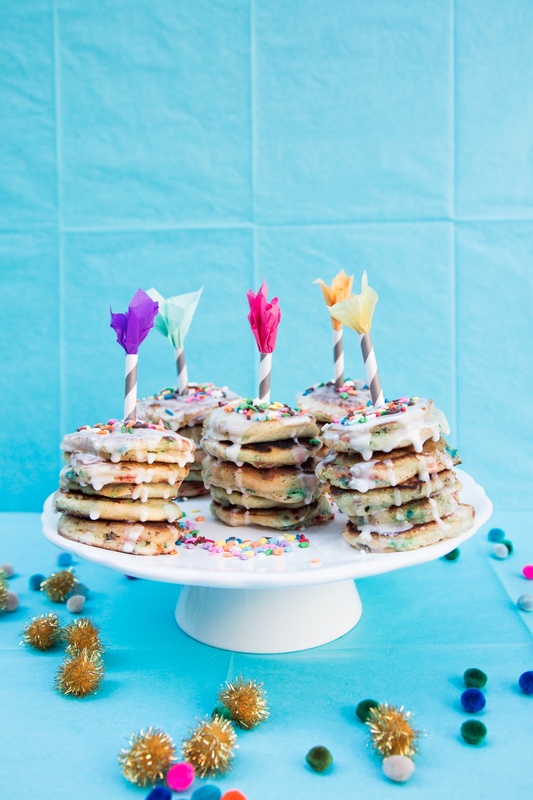 And in celebration of, I made you mini birthday pancakes! Remember funfetti cake? (of course you do) All of those sprinkles and moist white cake and creamy frosting? It was simply the best and one of my childhood favorites. Well, I took this childhood favorite and combined it with a current obsession of mine…pancakes! Dessert for breakfast? Yes, please! How awesome would it be to wake up to these colorful bite-sized treats on your b-day? Mini makes everything better, if you ask me. I love indulgences but I never feel good when I go overboard so mini versions of the real thing make me a happy gal. These silver dollar sized griddle cakes are the perfect serving of dessert for breakfast. The glaze topping makes them taste just like sprinkle donuts – which, let’s face it, are the best donuts ever! These cheerful little guys make me wish it was my birthday everyday! Enjoy! p.s. I found the cute little straw and tissue paper candles DIY here. Sift together dry ingredients in large bowl, set aside. Mix milk, eggs, and vanilla in a separate bowl. Stir in melted butter and sprinkles to the batter until just combined. Let batter sit for 10 minutes undisturbed. Cook on a greased skillet over medium-low heat until golden brown. NOTE: 1 tablespoon of batter will give you about a 3″ round pancake, which I found to be perfect. Sift the powdered sugar into a medium bowl. Whisk 1 tablespoon of milk at a time until you reach your desired consistency. The glaze should be thick and opaque. Top stacks of 3-5 pancakes with a generous dollop of glaze. Make ahead: Make these pancakes up to a week ahead and freeze unglazed until you’re ready to use. Reheat in a conventional or toaster oven on low heat until just warmed through. Adorable!! Great start to your birthday. Kids would go crazy over this idea. Happy birthday! I can’t get over how adorable these are!! Now I want it to be someone’s birthday over here so I can make them these! Omg! I want some so bad! What fun! Thanks for the pancakes, hehe :) And happy birthday! Happy Birthday!!! This is such a creative way to celebrate your birthday from the moment you wake up! I will definitely make this for my husband’s birthday. Thank you for sharing! These could not be any more adorable! Happy birthday! Happy BDay Paola!!!!!!!!!!!!! May this be the best year yet!!!!! — Kicking things off with the most adorable pancakes EVER! 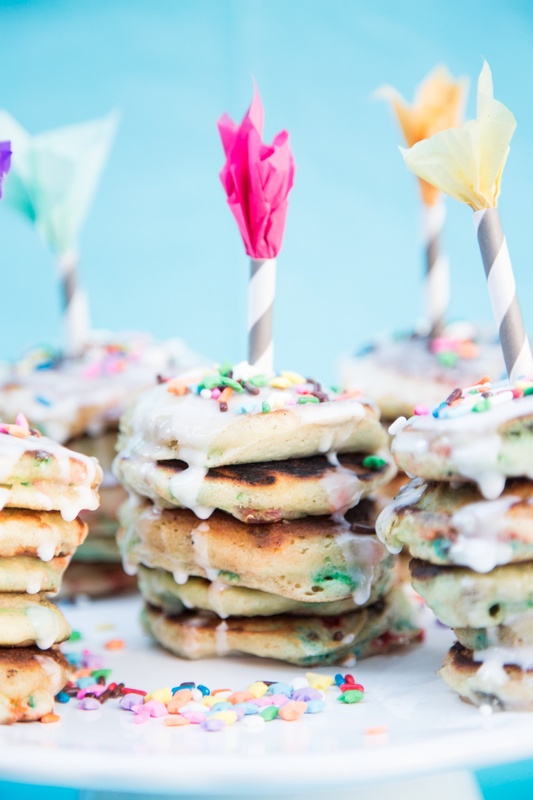 I want every day to be mini bday pancakes day ;) XO! How cute! What a perfect way to start your birthday! Have a great day! 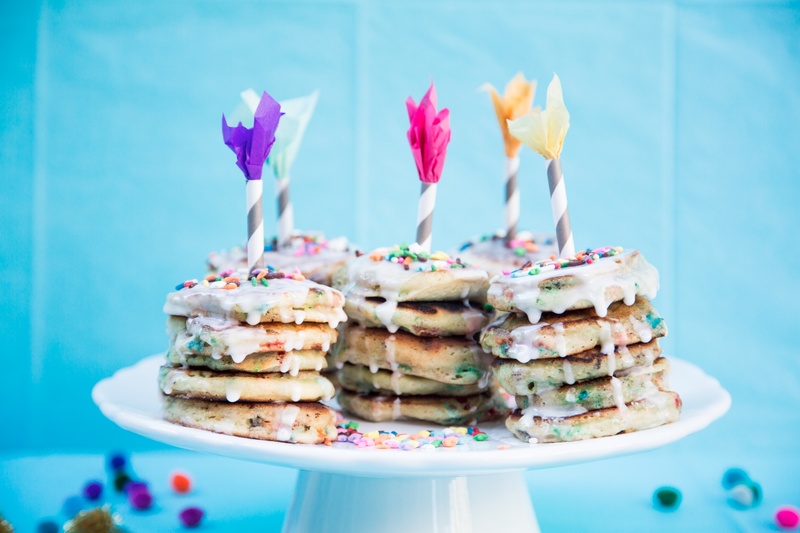 Mini pancakes AND your birthday?? Cheers to that!! Happy birthday, hope you had an awesome day! Love the look of these. Make pancakes mini so you can just say, ‘but their mini… 3 mini is like 1 big so… I can have 9?’ Sounds perfect. These are so cute and creative. Hope you had a legendary birthday. Happy birthday! We do birthday donuts at our house. Nothing to get your body moving in the morning but a candle in your favorite donut as people wake you up in the morning with “Happy Birthday” being sung to you. Hope you have a terrific day. Oh my gosh!! These are totally gorgeous and sprinkles make them outta this world! Happy Birthday! Such a lovely, cheery idea! These are soo super cute! I can’t wait to make them. Thanks. In Australia we call these mini pancakes “pikelets”, I always thought the name was just as cute as the pancakes themselves. They look delicious too!